Unpaid letter dated St. Thomas 13 June 1862 to Bordeaux, France. Loose packet letter sent with RMS „SHANNON” arriving and stamped “SOUTHAMPTON / PACKET LETTER / JU28 1862”, rare on letters. London Anglo-French accounting mark “GB // 1F60c” and charged double 8c rate “16” decimes charged. Right side of envelope stained. Letter sheet from St. Thomas 25 July 1840 to Marseille. “OUTRE-MER / PAUILLAC 25 AOUT 40” in red stamped and charged 15 decimes due by addressee. Routing instruction “P. Paquebot Bordelaire” on front. Entire dated St. Thomas 14. September 1855 to Caracas, Venezuela. 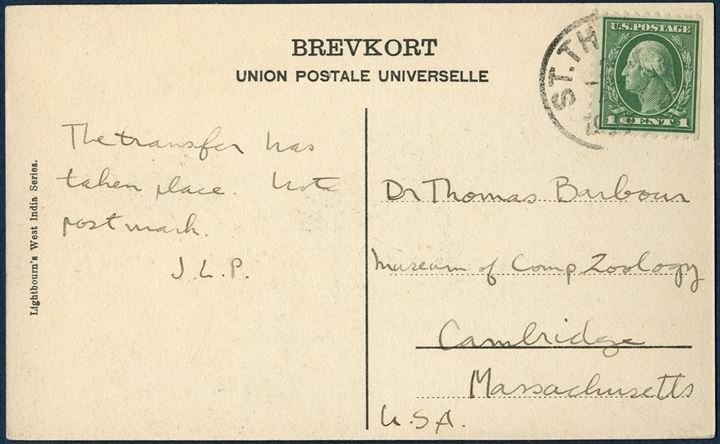 Sent through and stamped with “FOREIGN LETTER OFFICE - ST. THOMAS” on reverse. Routing instruction “pr. 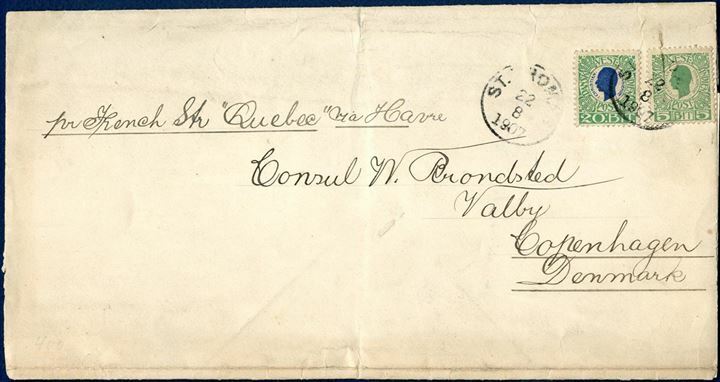 Isabel”, Venezuelan receiving mark struck on front and charged “2” reales due by addressee. Merchants in St. Thomas maintained the office from 1846 to 1860. Mail was bagged and shipped by private packets to avoid high charges of inconvenient schedules. "Lettersheet St. Thomas 25. April 1884 til Bordeaux, Frankrig. To 5 ¢ II. udskrivning bundet af CDS "ST. THOMAS 25/4 1884 "DAKA Ant. 3 bred "O". Routing instruktion "pr. Steamer via Southampton ", Fransk" CALAIS A PARIS 12 MAI 84 "og Bordeaux receing mark. Lodret fold i kuvert gennem to venstre frimærker." Entire dated St. Thomas 8. August 1884 to St. Croix, bearing 3¢ IV printing tied by CDS “ST. THOMAS 8/8 1884” DAKA Ant. 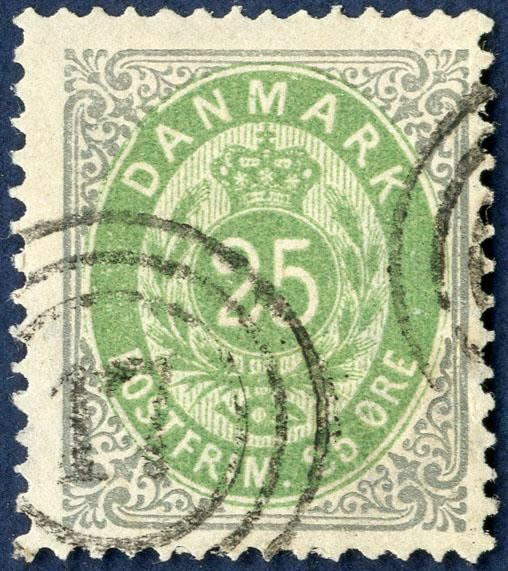 3 “wide O”, and receiving mark “CHRISTIANSTED 9/8 1884” DAKA Ant. 3 on reverse. Die proof in black of King Christian IX 5 øre denomination on cardboard paper, designed by Hans Tegner. 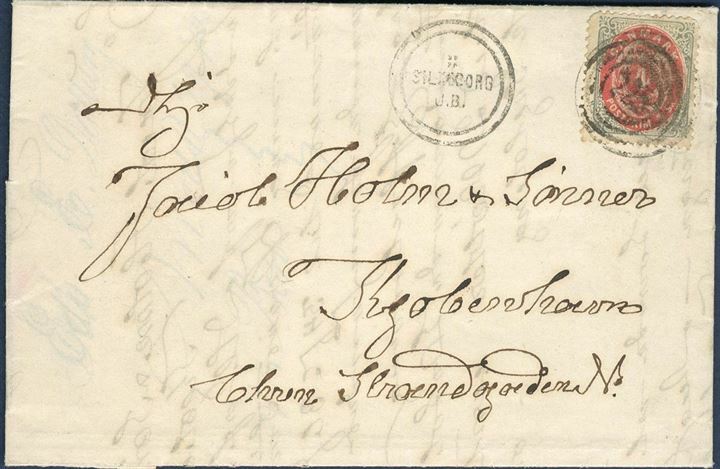 Envelope sent from Copenhagen 2 January 1866 to Sölvesborg, Sweden. Franked with 8 sk. 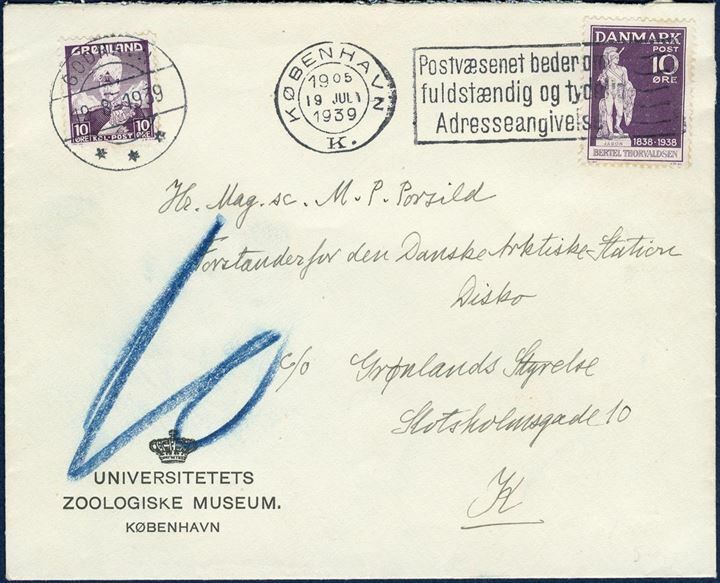 1857-issue dotted spandrels with even margins, tied by numeral 210 København Vesterbro (Skilling nr. 1, iflg. SKILLING seneste kendte dato), datostempel “KBH VSTB EXP 2/1 2-4”. Letter rate to Sweden 8 sk. from 1.10.1865 – 30.6.1869.